Amongst the most visited monuments in Paris, of course, is the Arc de Triomphe, which was commissioned by Napoleón Bonaparte. For all lovers of beauty and history, the Arc de Triomphe provides a stunning opportunity to enjoy spectacular views across the city from a height of over 50 metres. Buy your tickets on-line, save time and avoid having to queue for entry. The Arc de Triomphe which is situated at the start of the famous Avenue des Champs Elysèes is one of the most iconic monuments in the French capital. It was commissioned by Napoleón to commemorate his famous Battle of Austerlitz, as a symbol of his victorious military campaign. The construction took many years and was finally completed on his birthday but, after his death. There were many architects involved in bringing to life this imposing napoleonic project but after so many years, the original vision was somewhat different to the end result. In 1920, at the foot of the arch, the Tomb of the Unknown Soldier was placed and from that day forward, it became symbolic of the unidentified dead from the First World War. It is a work of majestic historical and cultural significance, a place that no tourist should overlook. In fact, there are nearly always queues for access to the Arc de Triomphe and in order not to waste your precious holiday time queuing, having a ticket that has been bought in advance on this web page will enable you to jump the queues. In order to avoid the queues, it is really advisable to buy your tickets on-line. Depending on the time of year, the queues can be really long! Getting to the top of the Arc de Triomphe is worth climbing the 284 steps it takes to get there. The panoramic views from the summit of this majestic monument, measuring around 50 metres high, will provide you with incomparable views of the area of La Défense, of the marvellous tree-lined avenue of the Champs Elysées and across Paris. The frequently large queues for entry can kill off one's desire to get to the top but, with the tickets that you can buy on this page, you will be able to jump the queue at the entry and can take advantage of the specially reserved preferential queue. So, what are you waiting for? Book your tickets now, provide the date and arrive for your visit at the time of your choosing between 10:00 in the morning and 23:00 at night. In order to reach the Arc de Triomphe, you should use the underground passage at the Avenue des Champs-Elysées or the Grande Armée. You should avoid trying to cross the road here as the traffic is extremely busy. When you arrive at the entrance via the underground passage, you can skip the queue at the entrance and proceed to the stairs to the right of the ticket office. When you are outside, walk directly to the line that is for reserved entry which you will find to the right, proceed to the compulsory security checks and lastly, show your tickets on your smartphone. On the day of your visit, just show your tickets on your smartphone outside the building and jump the queue. Entry tickets enabling you to "Jump the Queue." There is no timetable to stick to - you can enter any time between 10am and 23:00. 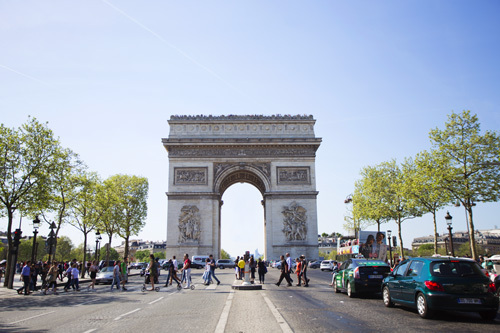 Would you like to know more about the history of the Arc de Triomphe? You can find plenty of useful and practical information on how to reach this monument in our article: The Arc de Triomphe. If you want further information about what to visit in the surrounding area, such as the Champs Elysées or Place de la Concorde, for example, you can read our itinerary which is specifically about the area of La Défense.